Green Valley, AZ, home to CSE II, just 25 miles south of Tucson, AZ is located in the Sonoran Desert. We live in an arid region in southwestern Arizona about half way between Tucson and the border town of Nogales, Mexico. 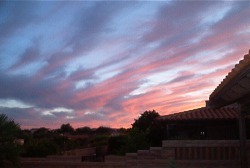 Warm winters attract tourists to Sonoran Desert resorts in Tucson and Phoenix. This is the hottest of our North American deserts, but rainfall patterns produce a high biological diversity. Winter storms from the Pacific nourish a variety of many plants and trees. Summer monsoons, in addition to providing a cooling effect, also encourage the growth of many desert plants. Freezing conditions can be expected a few nights each winter. We experience over 300 days of sunshine. 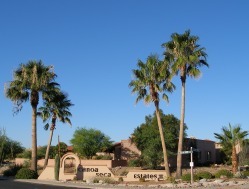 Our community affords unrestricted views of the Santa Rita Mountains and consists of 115 hillside homes. For the most part they are town homes, with a smaller number of stand-alone homes. Our elevation is 2900 feet. This provides cool evenings and lower summer temperatures than in either Tucson or Phoenix. Built on a hillside, homes in the community are located on the downside of each street allowing for large manicured common areas in the front of the homes and creating outstanding mountain views from the rear yards and patios. CSE II enjoys one of the best reputations as “the place to live” in Green Valley. Nearby are many golf courses both public and private. Shopping is available in Tucson, a major metropolitan area just a half hour north. To the south, is a quaint artists’ community, Tubac, AZ. ​Green Valley Recreation (http://www.gvrec.org) is available to all residents. In addition to recreation centers, with well-equipped work out equipment and swimming pools, there are classes in a variety of activities from hiking to painting.